Michigan Audubon maintains a statewide network of bird sanctuaries. The network consists of 18 sanctuary properties that together total more than 3,500 acres. The habitats we protect and steward include: rivers, lakes, marshes, bogs, fens, grasslands, hardwoods and northern conifer forests. Each property plays a critical role in protecting Michigan native plants and animals, including both endangered and threatened species. See a map of our sanctuaries and a full list at the bottom of the page. Have questions about visiting or volunteering at our sanctuaries? Visit our contact page to get in touch. The Bernard W. Baker Sanctuary is North America’s first bird sanctuary dedicated to the conservation of Sandhill Cranes. Baker Sanctuary spans approximately 980 acres in Calhoun County, making it the second largest property owned and managed by Michigan Audubon. The sanctuary is best known as a refuge for nesting and migrating Sandhill Cranes. Baker’s centerpiece habitat is the 200-acre Big Marsh Lake, a restored wetland flooding. More than 200 species of birds have been recorded here. The Meadow and Marshland Trail, accessible from 15 Mile Road between T Drive North and Q Drive North, was established in the spring of 1996 for hiking, cross country skiing, and nature observation. The trail is a mowed during the summer and is easy to navigate. Throughout the spring and summer, an abundance of wildflowers and the fauna they attract can be found. Deer, turkey, fox, coyote, hawks, frogs, turtles, butterflies, bluebirds and other species frequent the area surrounding the trail. Habitats at Baker Sanctuary include ponds, streams, cattail marsh, tamarack swamp, oak opening, floodplain forest, wet meadow, and ongoing prairie and wetland restoration projects. Notable birds include Bald Eagle, Osprey, Northern Harrier, migrating waterfowl, and diverse warblers. Located in a major migratory flyway, this 394-acre sanctuary in Keweenaw County is entirely wooded with a mixture of northern conifers and hardwoods. Its highest point is along Brockway Ridge which is easily accessible by Brockway Drive. Views are spectacular and birdlife includes migrating birds of prey such as Broad-winged and Sharp-shinned Hawks and the occasional Golden Eagle. Twinflower, many orchids, plants of rock outcroppings and wet forest are found here. Amenities: Parking. Maintained Trails. Overlook. No Restrooms. 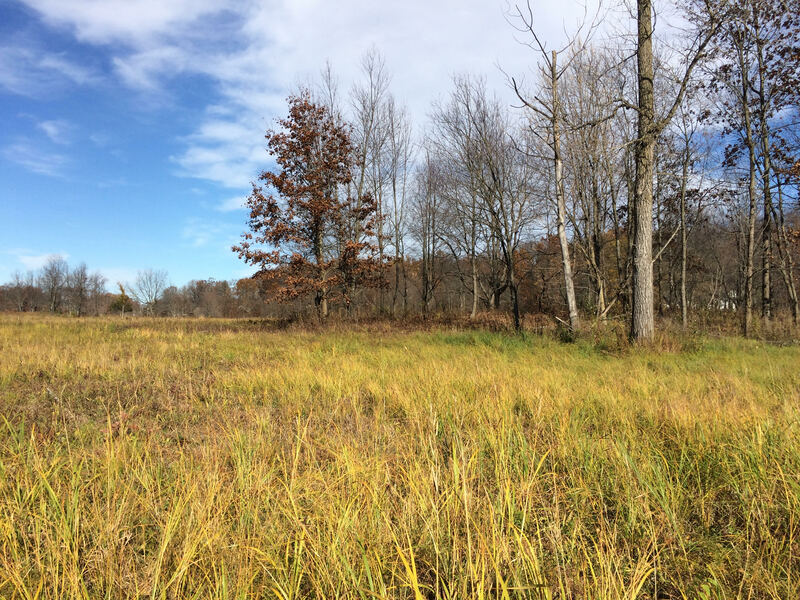 Located on the banks of the Grand River in Delta Township near Lansing, this 63-acre property is an oasis of habitat in an expanding suburban area that attracts spring and fall migrating warblers. Walking paths lead through grasslands, shrub habitats, and along the Grand River. The sanctuary is adjacent to Hawk Meadow, a Delta Township park, whose land was also donated by Michigan Audubon benefactor, Carl Haussman. Amenities: 1.8 miles of easy, mowed hiking trails. Parking available at Hawk Meadow; walk across the street for kiosk and main trail head. Demonstration native bird garden. Nest box trail. Davis Bog Sanctuary is an 80-acre bird sanctuary that is mostly composed of Duck Lake and its surrounding swamp lands. Although there are no maintained trails, you can explore the swamp on the northeast end of the property between the snowmobile trail and the lake. The habitat is cedar swamp with bog plants like Pitcher Plant and Sundew. Notable birds include migrating waterfowl in the spring and fall, and typical bog birds like White-throated Sparrow. Although bisected by a busy country road, this 53-acre sanctuary in Jackson County is home to a mature hardwood forest that nestles Sandstone Creek. Biotic communities include upland and lowland deciduous woods, a grove of large Eastern White Pines, and a marsh with natural springs that flow into Sandstone Creek. This is one of the richest woodlands in Jackson County for spring wildflowers. Two champion trees of Jackson County, American Hornbeam and Shingle Oak, grow here. A host of birds frequent the area. Volunteers recently constructed a boardwalk and woodland hiking trail. Amenities: Parking. Maintained trails. No Restrooms. Kate Palmer Sanctuary Website Maintained by the Kate Palmer Stewardship Committee. This is an entirely wooded 405-acre sanctuary in Keweenaw County. The low area immediately adjacent to the parking area is cedar swamp but it is usually dry and passable using the hiking trail. The trail traverses a steep incline through a hardwood forest to a precipice overlooking the area. Migrating birds of prey are especially abundant in the spring. Likely sightings include Broad-winged Hawk, Sharp-Shinned Hawk, and the occasional Peregrine Falcon or Bald Eagle. In 1988, the Michigan Audubon Society received as a gift the M.E. and Gertrude Gray home and property, which later became Lake Bluff Bird Sanctuary. Atop an 100- foot-high bluff overlooking beautiful Lake Michigan, Lake Bluff Bird Sanctuary boasts over 1,700 feet of Lake Michigan frontage on its 75 acres located just north of Manistee, MI. Originally landscaped as an arboretum, many notable specimens have been preserved on the grounds surrounding the home such as California Redwood, Ginkgo, and two Michigan Champion Trees, a Giant Sequoia and a Sycamore Maple. Over 170 different types of birds have been seen on the property, there are many resident woodpeckers, and eagles are frequently seen flying up the beach or perching in the trees along the shore. Lake Bluff is a quiet place; one that most people find relaxing due to its serene natural habitat. The grounds at Lake Bluff Bird Sanctuary are open to the public year-round, every day from dawn until dusk. No appointment is necessary; just stop by, park your vehicle and begin to explore the natural beauty of this jewel on Lake Michigan’s shore. Maintained Trails: Two miles of hiking trails offer stunning views. It’s not unusual to spot white-tailed deer along the trails. Hike through mature forest or around the property and to the beach. Beach Access: Visitors have easy access to Lake Michigan’s beautiful, sandy shoreline for beach walks, sunbathing, swimming and other water activities. Parking is ample and restrooms are available. Lake Bluff is a smoke-free and pet-free environment. This 40-acre, landlocked sanctuary is within the Whitefish Point Global Important Bird Area. An upland ridge forested with Balsam fir, birch, Red Maple and White Pine, traverses the southwest corner of the property. Approaching the shore of Little Lake, northeast from the ridge, the land abruptly transitions to Tag Alder and then to a mixed shrub/bog and an open bog with Tamarack. The transition zone of the shrub/bog habitat supports the richest diversity of migrating birds on the Whitefish Peninsula. Amenities: Access by appointment only. The 40-acre Margaret Shroyer Sanctuary is in the Whitefish Point Important Bird Area, a globally significant site designated as a migration stop over for Red-necked Grebes. Most of the area is Jack Pine dominated forest interspersed with seasonally flooded wetlands. This sanctuary is landlocked and there is no access. A former farmstead and woodlot, this 80-acre sanctuary has a fine stand of oaks, hickory, and walnut. There are open and shrubby fields along with some low swamplands. Typical southern Michigan birds such as Eastern Bluebirds, Field Sparrows, and Red-eyed Vireos are found here. At this time, there isn’t a maintained trail but it is under consideration. Amenities: Parking. Social Trails. No Restrooms. This 40-acre sanctuary northwest of Kalamazoo has a mature Beech-Maple forest that in all likelihood has not been logged. The understory and groundcover are diverse with spring ephemerals and shrubs. Trout Lily, Toothwort, Spring Beauty, Dutchman’s Breeches, Squirrel Corn, Blue Cohosh, violets, Wild Leek, Trillium, Mayapple and more. The local Audubon club has an aggressive invasive species removal program working to rid the sanctuary of Multiflora Rose and Garlic Mustard. The sanctuary isn’t all mature forest, it has a fallow field where the occasional Eastern Meadowlark or Henslow’s Sparrow is seen and heard. A trail system is being considered. Amenities: No Parking. No Trails. Otis Sanctuary is adjacent to the Globally Important Bird Area, Barry State Game Area, which is recognized for providing critical breeding habitat for Cerulean Warblers. The 128-acre bird sanctuary hosts rolling fields, mature forest, expansive marshland, a stream, kettle hole marshes, and several springs. Notable bird species at the Otis Sanctuary include: Pileated Woodpecker, Red-headed Woodpecker, Grasshopper Sparrow, Henslow’s Sparrows, Warblers, Bald Eagle, Osprey, and Sandhill Crane. Otis Farm Bird Sanctuary is located at: 3560 Havens Road, Hastings, Michigan. A parking area is accessible from spring until fall, depending on ground conditions. A portable toilet is on site between May and October. Michigan Audubon members may launch kayaks and canoes on Glass Creek using a small launch, and a rustic cabin is available to rent. Please call 517-580-7364 for information about renting the Otis cabin. The Owashtanong Islands Sanctuary is one island and part of another which is part of a complement of islands and shoreline wetlands in the lower Grand River. Wetland birds nest and migrate through the area. Amenities: No Parking. No Trails. No Restrooms. Access by Appointment Only. Michigan Audubon’s largest bird sanctuary is located in Jackson County bordering the Waterloo Recreation Area. At 1,008 acres, it is known to attract thousands of migrating Sandhill Cranes every fall. However, the diversity of animal and plant life includes over 270 plant species and 200 species of birds. Benches on a hill overlooking Mud Lake Marsh provide an ideal location for viewing large numbers of cranes in October and early November. A restored wetland and grassland demonstration area at the west side of the sanctuary is accessed from Wooster Rd. Public access to the marsh is restricted. Amenities: Parking, Maintained Trails, Seasonal Restrooms (fall only), Handicap Accessible Viewing Area, Information Kiosk. Riverbank Sanctuary is a 23-acre sanctuary on the shore of the Indian River just outside of Manistique. Mostly, it is pine forest but there are areas of black spruce swamp, wetlands along the river, and shrub swamp. Although this is found in a residential community, there is plenty of wilderness nearby and some wild species have been sighted here such as Common Loon, Pileated Woodpecker, Black Bear, and American Beaver. Amenities: Parking. Maintained trail. No Restrooms. Located in an area of glacial moraines, this sanctuary contains rounded ridges, seasonally flooded ponds, a stream, and lake. Most of the 108 acres is wooded and contains old-growth beech, oak and tulip trees. Large evergreens provide additional woodland habitat. The sanctuary is botanically quite diverse and includes a number of threatened and endangered plants. The sanctuary is adjacent to the Barry State Game Area Global Important Bird Area and is home to breeding forest birds such as Acadian Flycatchers, Ovenbirds, Scarlet Tanagers, and Yellow-billed Cuckoos. This 35-acre sanctuary is a fine example of a Beech-Maple woodlot with a delightful profusion of spring wildflowers. It is home to forest birds such as Red-eyed Vireos, various Woodpeckers, and Acadian Flycatcher. Amenities: Parking. 1 mile of maintained trails. No Restrooms. This is a 240-acre prime sphagnum bog on the edge of a large glacial outwash containing a marsh. White Cedar, Osiers, Viburnums, Willow and Northern Bush Honeysuckle form dense growth. Labrador Tea, Bog Laurel, Sweet Gale and various bog orchids are abundant. The sanctuary and surrounding areas provide prime habitat for nesting Sandhill Cranes, Spruce Grouse, Solitary Vireos, Northern Parula Warblers, Boreal Chickadees, Sedge Wrens and Gray Jays. Amenities: No Parking, No Trails. Both under consideration. Michigan Audubon, with financial support from private, state, and federal agencies, is actively engaged in habitat improvement projects at the Haehnle, Baker, and Otis sanctuaries. To learn more about these ongoing projects to restore grassland and wetland habitats for birds like Henslow’s Sparrow and Sandhill Cranes, please visit our blog and subscribe to our email newsletter. 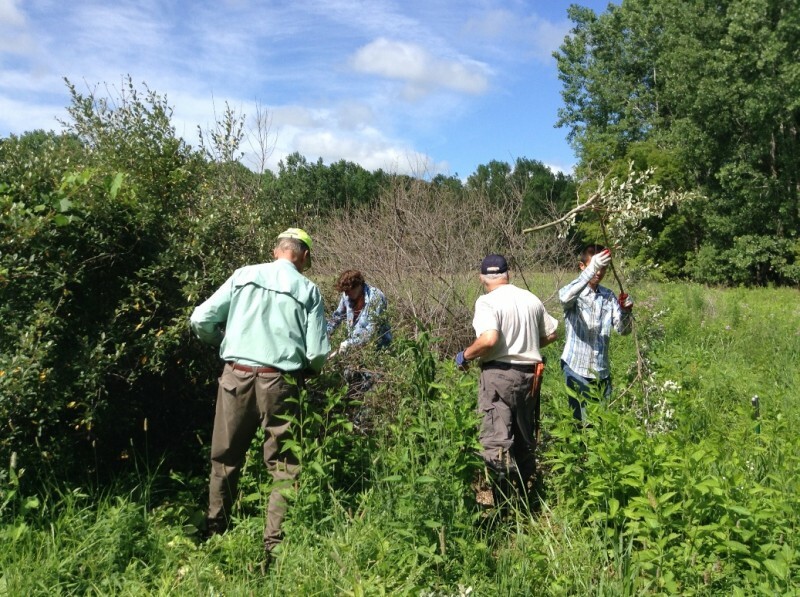 Michigan Audubon relies upon dedicated volunteer stewards to maintain the sanctuaries. These tasks range depending on stewards’ interests but may include trail maintenance, biological monitoring, invasive plant removal, and fundraising. If there is a sanctuary that you care about and you would like to learn more about becoming a volunteer steward, we would love to hear from you! Please contact the Michigan Audubon office.